This is a small collection of Donna Young's quarterly, semester, term, and class lesson planners. There are several styles to choose from. Most of the lesson planners on this page are PDF. If you prefer DOC files, please visit the page holding The Garamond Planner. These are the planners that I made to use for my children's upper elementary and high school years and sometimes I call these types of planners Subject Planners . 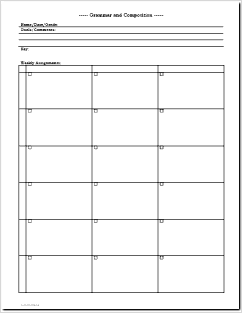 If you are unfamiliar with this type of lesson planner, please visit my help pages. Using the Quarter Planner for examples of using this type of planner. Quarter planners have a 5 x 9 grid which implies 45 days or one quarter of a school year of 180 school days. This planner is the original *un-keyed planner. The file prints on one sheet of paper and has 9 rows and 5 columns. *What is a Keyed Planner? A keyed planner has coordinate reference marks such as I, II, II, etc across the top and either numbers or letters down the side. The first block would be "IA" and if you needed to record a grade on a grade sheet, you could use the coordinate reference such as: Math IA, 90%. This planner is keyed. 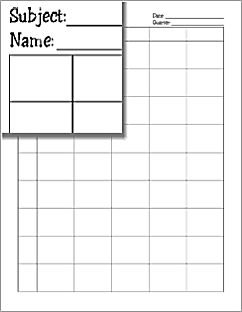 This quarter planner will print on 4 sheets of paper or on both sides of two sheets of paper. 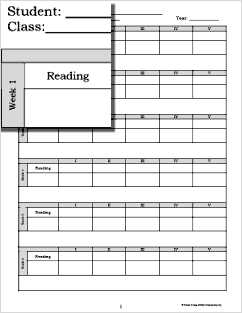 This planner is meant to be used to make lesson plans for one subject. These are not the only quarter planners that I have, please visit Sets and browse the various matching homeschool planners sets. A semester planner has a 5 x 18 grid. That implies 90 days and that is 1/2 of a school year or one semester. This planner is keyed. The semester planner is to be used for one subject for 36 weeks. It prints on two sheets of paper. This is the planner I use most often for high school subjects. This is one of my older files that I am adding back to donnayoung.org. With this planner I have given you ruled space at the top for your ideas, goals, plans. At the bottom is a keyed 5 x 6 grid. The Yellow Planner, my personal favorite. The science planners print on 6 sheets of paper or 3 on both sides. 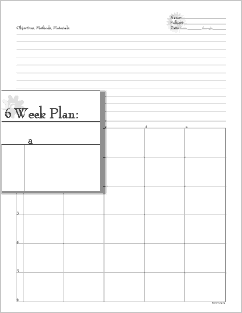 Each page is a six week planner which can be used for any subject. The spaces are labeled: week one, week two .. etc.. In the lesson plan areas, one space is labeled "reading" and the space underneath is unlabeled and may be used for lab, projects, or something else. Under each week is a section for comments, supply list or whatever you need to use it for. This planners are designed after the format that I created for my Exploring Creation with General Science lesson plans. The planner is labeled Grammar and Composition and it is the planner that I used for high school English. 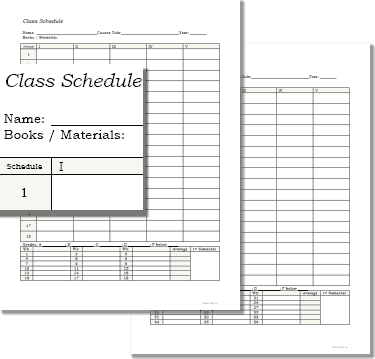 The planner has three columns and each column is to be used for a different part of English.